It’s November and the end of the warm water surf season, that is, to New York-based surfers like Ben Sargent. To the rest of us average human omnivores with tastebuds that signal richness, warmth, nostalgia and most of all deliciousness, however, it is most certainly the beginning of chowder season. Fortunately for us, Brooklyn’s own Chowder Surfer is here to share both of these high seasons all year ’round. 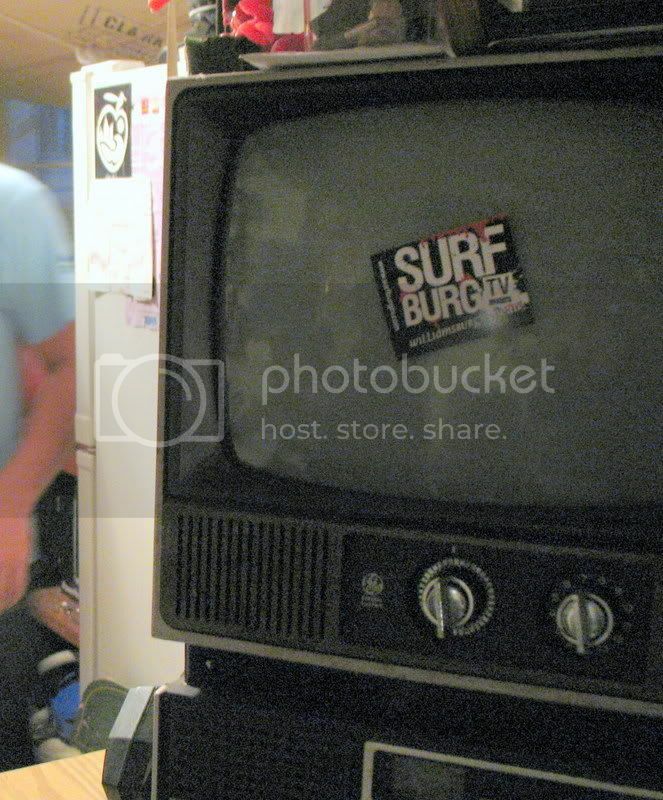 Ben Sargent, self-taught chef, former proprietor of New York’s surf bar Hurricane Hopeful, and star of the only online TV series chronicling the adventures in chowder-making via surfing (or is it the other way around? 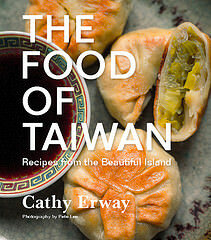 ), was kind enough to chat over a steaming pot of home-cooked chowder for this blog. For this occasion, I got to visit Ben’s lair in Greenpoint, a low-ceilinged basement studio made even lower from its entire length being lined with surfboards. 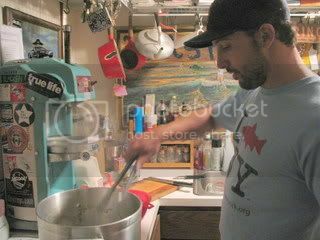 Fittingly, the space quickly filled with the pungent aroma of the sea as Ben demonstrated his classic clam chowder recipe. First- and second-generation Williamsburg foodies might recall a similar scenario involving boards, rubber sharks and other surf paraphernalia that flocked Ben’s original restaurant on North 6th St. Its floor was also covered entirely with sand. Hence, it was a flip-flop friendly surf shack, with reckless New England spirit, hard-hitting cocktails (I once learned my lesson on one called “The Fogcutter”), succulent lobster rolls and of course, the finest chowder in the city. So good was Ben’s chowder that it landed him on the fateful first episode of Throwdown with Bobby Flay. Something like The Food Network’s twisted answer to Candid Camera, only where in this case, the victim thinks the camera is shooting his own cooking show pilot, Throwdown regularly pits acclaimed chef and restauranteur Flay against a humble master of a certain dish, like mac ‘n cheese or jerk chicken. And the dish that started it all, of course, was chowder. Ben’s subtley Thai-spiced Bohemian monkfish chowder went up against Chef Flay’s lobster corn chowder in a guts-for-glory cooking contest held by the sea — er, the East River, from Williamsburg’s Grand Ferry Park. But we’ll get to that in a little while. clams, white wine, dill and thyme — oh my! 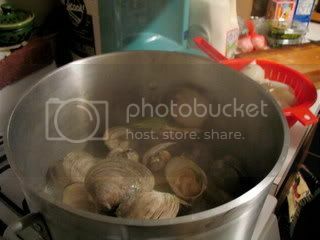 What’s the chowder that you’re making tonight? This is my grandfather’s clam chowder. I’m making it tonight without one ingredient, though, because I couldn’t find it. It’s the salt pork. This went back to the days when they thought fish didn’t have protein, so they added bits of meat. When did you decide that chowder was more than a hobby, or a favorite food, and something that you wanted to focus on as a career? Well, any time that I’ve strayed from chowder, things haven’t worked out — It’s like, this is what I do, I make chowder, and here, meet me. The restaurant that started it all [in 2001] was, I think, a gem. I didn’t have much help, and I was the only one in the kitchen, but the concept was perfect. It was just this New England chowder shack, like, come in, and talk to the other surfer at the bar. My friends would be able to get off the L train on their way to catch the A out to the Rockaways. I lived in that spot, too, and I used to sleep literally over my chowder pots. Is this the concept you’ve been continuing in your online TV show? The show is a bit like exploring all these characters and places with chowder as the vehicle. You go and check out this farm in Rhode Island, where you pick up one ingredient, or this sea market somewhere else. You get a little surfing, a little lowdown on a spot, a do-it-yourself way of living, a recipe, and then a little diddy on the ukelele. My episodes get a little loose, though. Like, in one episode I’ll be trying on outfits at Beacon’s Closet. So it’s kind of like, Chronicles of the Surfer Guy? Yeah, it’s almost like The Catcher in the Rye – a lost soul searching for chowder [laughs]. It’s like, I like to fish… and there’s something about it that feels like home. It’s like days spent fishing with my grandfather, pulling up the traps. This is going to sound really cheesy, but there’s something about the late afternoon sun, being tired from the day’s work, all the smells of cooking, and this pine smell that was always in the air where I lived… I have this great memory of the time when my grandfather gave me the key to his fishing closet. My dad was so surprised because he couldn’t believe he’d entrusted the key to me, and not to him. Why do you think surfers love chowder? I invented that! Ha — I don’t know that they do, probably more accurately it would be peanut butter and jelly, since I don’t know if most surfers could afford anything else. What was it like to lose a Throwdown to Bobby Flay? Aw! And it was so close, too. How did The Food Network find you? [Sigh.] So, on your TV show, is there an upcoming episode we can look forward to? Or new chowder recipe? Well, I just got back from Costa Rica and will be featuring a surfing spot and a Costa Rican fish preparation there called Rondon. It’s a coconut milk preparation [meaning, literally, “whatever the cook can run down” —Ed.] that turns out to be a pretty thick stew, but I turned it into a chowder with a few adjustments. A Martha’s Vineyard episode should be up not too long after that. 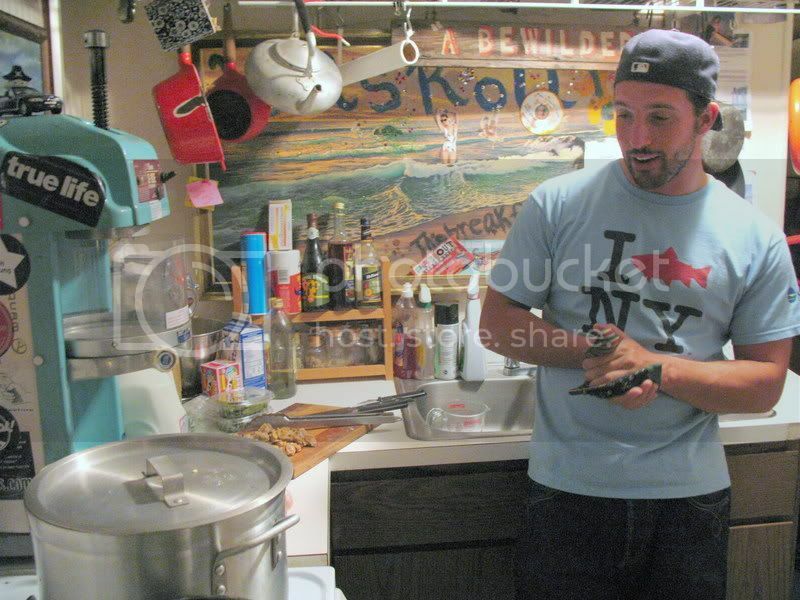 Keep watching www.brooklynchowdersurfer.com for news, videos and more chowder lore. Ben’s writing can also be found in The Surfer’s Journal. I remember the first Hurricane Hopeful very well, as it was located on my walk home from the Bedford Ave. subway stop. I used to stop in for a take-away container of whatever he had going. And his non-chowder soups were pretty good, too, whatever he says about them. Nice piece! Is that a Hawaiian shaved ice machine in the back ground? Hi Ben, my daughter & I would like to know where we can purchase some of your chowder? We’re intrigued…thanks. This is the most �relate-able� cancer story I�ve ever read; it�s in the way you wrote it. Most of us share the same fear and feel we would think the same way, i.e., constantly thinking about what�s in us while doing other activities. The voice you give to this story is comforting and I thank you for sharing it! I�m so glad it worked out!